A Norwegian all-you-can-eat herring feast in the fall and winter, followed by a spring break party in the Caribbean… What a life! Maybe that’s why humpback whales keep commuting back and forth between the two extremes. 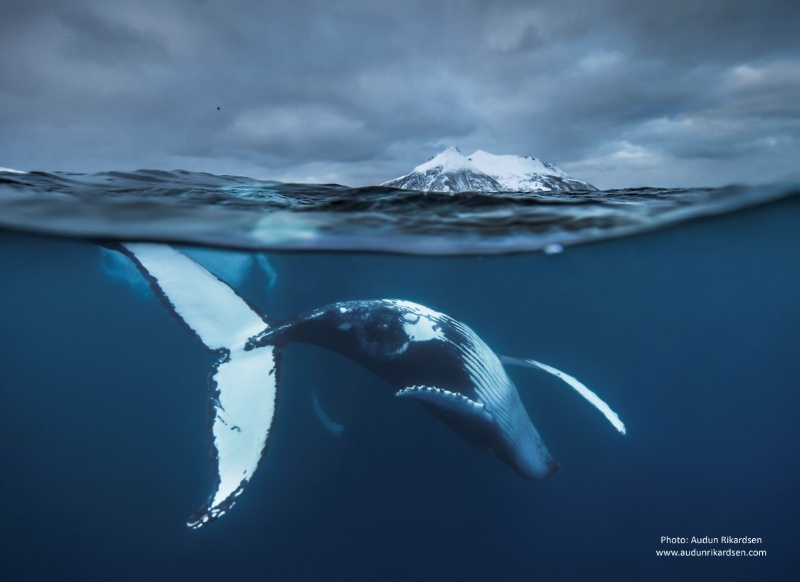 Professor Audun Rikardsen and his team from UiT The Arctic University of Norway has been following the migration of humpback and killer whales for a couple of years now. Through satellite tagging, they can follow the whales from their feeding frenzy up North to the mating grounds down south, and back again until the tags fall off. Last year one of the whales only stayed for a couple of hours in the Caribbean, after a three month migration, before heading back north. Maybe it was happy with just a «quicky», says professor Audun Rikardsen. 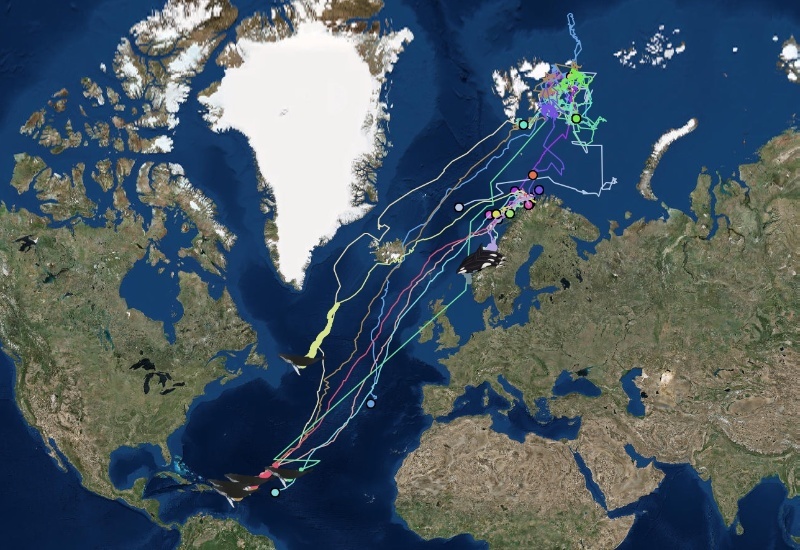 Rikardsen and his team marked ten humpback whales in the Barents Sea in September 2018 during a research cruise organized by the Institute for Marine Research, and you can follow their migration here in real time. You can also see the track of the killer whales that Rikardsen and his team tagged. Several of the whales have still not lost their tag, and at the moment they are in the area around the Caribbean island Guadeloupe. Some may be here in search of their soul mate or a «one night stand». While others may have come to warmer waters to give birth and take care of their newborn calves. This is the first time we have tracked as many as 6 humpback whales all the way to the Caribbean, says an excited Rikardsen. The researchers are excited because the satellite tagging enables them to see what the humpbacks are doing in greater detail during their migration. Already they can see that the animals are using a greater area than previously estimated. One animal swiped into Russian waters, one took a detour around Iceland, and one is currently lounging near Newfoundland. Previously we relied on ID-photos of the humpbacks, but it’s like finding a needle in a haystack to re-photograph the whale 8000 kilometres from where you first photographed it, the professor says. When a humpback whale dives, they usually lift their tail flukes, showing the underside of the tail. Each fluke has a unique pattern and no whales in the world look the same. By photographing the flukes, scientists can recognize particular individuals and follow their migration worldwide. This has provided us with important data, but it only tells us where the whales have been photographed and no information in between locations. Satellite tagging is today the only method to get continuous information over such large areas. 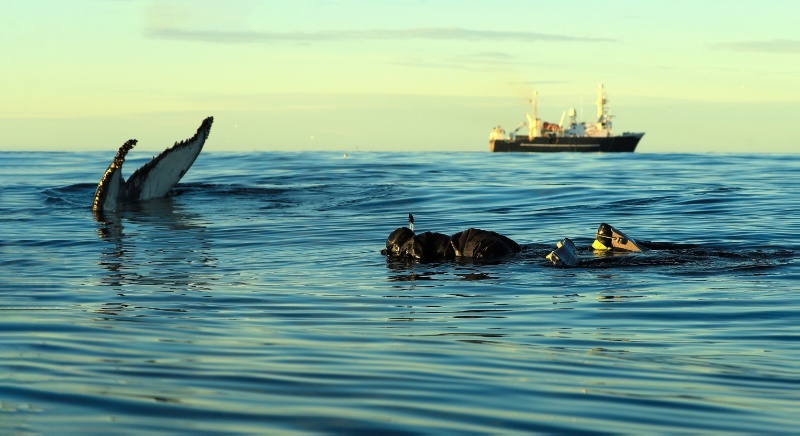 – We are still hoping that our partner in Guadeloupe can catch some of «our whales» on camera, to give complementary data to our project and to check on the attachment of our tags, Rikardsen says. The humpback whale photographed by professor Rikardsen under water. Foto: Audun RikardsenThe humpback whale (Megaptera novaeangliae) is a species of baleen whale, and it is one of the largest mammals on Earth. According to Wikipedia adults range in length from 12–16 m (39–52 ft) and weigh around 25–30 metric tons (28–33 short tons). 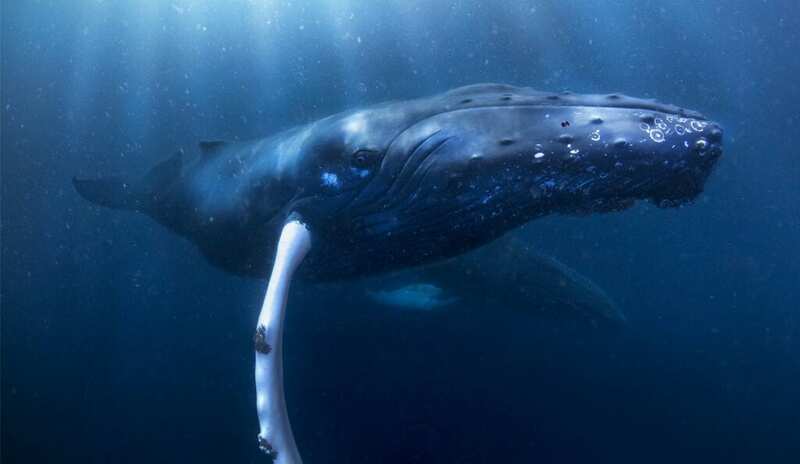 The humpback has a distinctive body shape, with extremely long pectoral fins and a knobbly head. It is known for breaching and other distinctive surface behaviours, making it popular with whale watchers. Humpbacks are widely distributed and may be found in all oceans of the world. Most humpback populations undertake extensive annual migrations from high-latitude summer feeding grounds to low-latitude winter breeding grounds and back. Their migrations are the longest known for any mammal on Earth and the distance between their feeding and breeding areas can be up to 8000 km or more (one-way!). The researchers don’t know exactly why the whales migrate such a long distance. Maybe it is because the water is warmer for their newborn calves? Maybe it’s safer because there are no killer whales in the Caribbean, that could potentially kill the calves? Maybe it’s just nice to be somewhere warm and exotic when you are looking for that someone special? One of the tagged whales that reached the Caribbean this week is a large calf travelling with his mom, professor Rikardsen explains. Calves travel with their mother a couple of times to learn the migration route before they have to do it on their own. In the Eastern North Atlantic, humpbacks are generally found in the Barents Sea and around the Svalbard-archipelago during the summer and fall. Later in the autumn, around mid- October, some individuals have in the recent years started their migration southward where they have taken a “pit stop” at a stop-over area in some of the fjords of Troms in Northern Norway during the dark winter months. This started happening in 2011 when herring started to enter some of the fjords to overwinter. This appears to be a stop-over area where the whales feed in excess of food to gain extra energy for their upcoming migration towards their tropic or subtropical breeding grounds, such as the Caribbean or West Africa. During this migration, that may take half a year in total, they generally do not feed. Rikardsen explains that the tags that are still on the whales have been attached for up to 7 months now, and they are hoping that the tags will stay on for a while longer so that they can follow the migration back to the north as well. It is so exciting to follow the whales through satellite, I must say I get a bit addicted and check them several times a day to see what they are doing, Rikardsen says. The intention of the study is to map different aspects of the migratory behaviour of humpback whales to reveal new and important data for the general understanding of their biology and migrations, and for management issues related to human interactions and disturbances. This year, killer whales have also been added to the project and they can also be followed via satellite on the Whaletrack website. The project is carried out in close cooperation with the Institute of Marine Research (IMR) and other national and international partners. The tagging is approved by the Norwegian animal health authorities and is performed by trained professionals. The project is supported by The Regional Research Council, VISTA, UiT, the Fram Center and IMR. The new WHALEFEAST-project (2018-2021) will also include tourism and fisheries industry in the project. 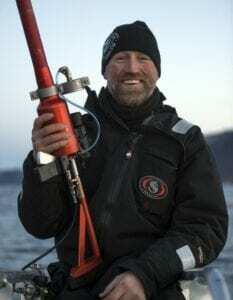 Professor Audun Rikardsen leads the Whaletrack project that studies whale migration.